The UUA Growth Strategies Office purchased ten thousand glow-in-the-dark temporary tattoos to pass out at General Assembly and to make available to congregations and Unitarian Universalist groups. If you attend a camp or conference this summer, you may see these tattoos as fashion and religious statements. Someone asked me how these (on the surface) whimsical tattoos could possibly be a growth strategy. I suggested they wear one visibly, go out into the wider community, wait for someone to point to it and ask, “What is that? What does that mean?” and then come ask me that question again. How many of us wear symbols of our faith on a regular basis putting our elevator speech to the test? And honestly it was just plain, old fun to see each other’s chalices glowing in the dark during times the plenary hall got lights were dimmed and to see the creativity of place selection! 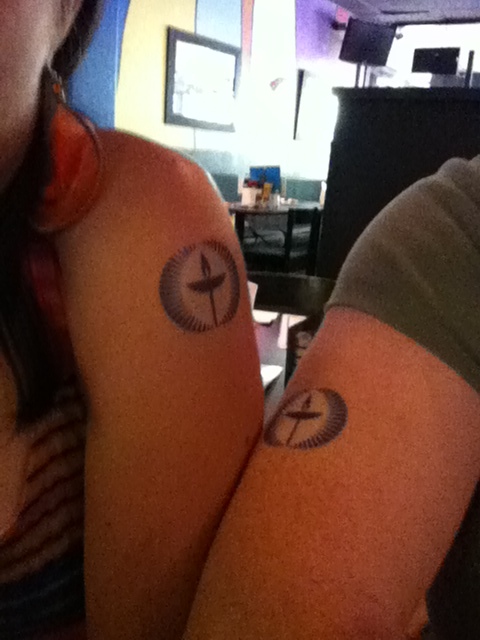 The temporary tattoos dispelled the myth that we don’t know how to testify and put our faith out there demonstratively. The temporary tattoos gave people the ability to try out a chalice tattoo as if our religion was worthy of permanence and mattered enough to commit all-in on skin. People wanted to have fun. They wanted to represent and be identified as Unitarian Universalists. And they sure did, all over Phoenix. People of all ages sought them out in almost a frenzy. I was surprised and delighted. Elders, babies, youth, middle agers, people in tie-dye, people in suits, all rocking the glow-in-the dark chalices. Biceps, wrists, cheeks, ankles, anywhere skin showed. When people asked for a tattoo I’d in turn ask how they grow our faith and then engage in conversation and soak up their stories of living Unitarian Universalism. It was inspiring and uplifting. People wanted to claim our chalice, or perhaps be claimed. Please send pictures of you sporting your chalice tattoo so it may be shared on Growing UU Facebook. Please share your glow-in-the-dark chalice tattoo stories in the comment section. We’d love to hear. A great “low tech” way to generate buzz, engage, and spread the word! I thought the tattoo idea was CRAZY when I first heard it. I was wrong. What a great idea! I had lots of folks ask me questions when I got home and they stayed long enough to listen to my explanations of unitarian universalism.I also got quite a few compliments on the design. Now I need to know where to order more for our young adult ministry! Any advice?